Has it ever occurred to you to make your own deodorant? If the answer is no, that's ok, I understand. But before you decide it's crazy and there's no way a homemade natural deodorant could possibly work, take a moment to familiarize yourself with common deodorant ingredients and how they might be harmful to your health. Even if you've experimented with commercially-available natural deodorants, I urge you to try this recipe. I tried a readily-available, natural deodorant a while ago and wasn't pleased with the results, and it has taken me about a decade to work up the desire to try another all-natural deodorant. This recipe really does work, so please don't let past failures bias you against the entire idea of natural deodorants. This DIY deodorant t is not an antiperspirant, but sweating is actually good for you. It does, however, keep you from smelling funky. I work outside and have tested this recipe on a day when I was visibly sweaty. Amazingly, I found I smelled better at the end of the day than when I use commercial deodorants! Additionally, this DIY deodorant does not lead to smelly, unsightly, permanent shirt stains. Give it a try - I think you'll be glad you did. 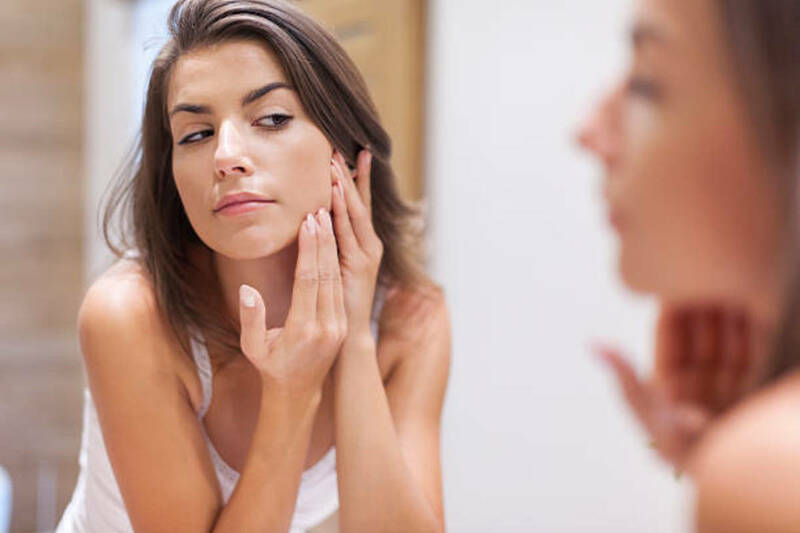 While the news and Internet are full of pieces decrying deodorant's health risks, there are very few definitive answers about deodorant's safety. 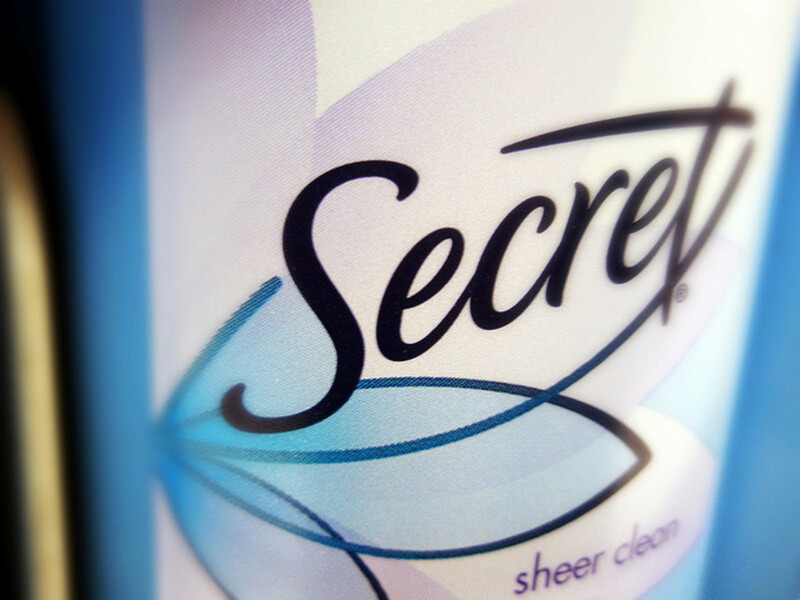 Here are some of the knowns and unknowns about common commercial deodorant ingredients. Aluminum salts are one of the most prevalent active ingredients in antiperspirant deodorants because they effectively block perspiration. Aluminum salts are not usually found in non-antiperspirant deodorants. Toxicology studies conducted by Dr. Curtis Klaassen show high levels of aluminum in the brains of patients dieing from Alzheimer's. No conclusive evidence can link these higher aluminum levels to deodorant use. According OSHA, the Occupational Safety and Health Administration, exposure to high levels of aluminum can cause speech disorders, dementia, and other neurological disorders. Once again, there is no conclusive evidence showing aluminum salts are absorbed in significant enough quantities to cause these neurological problems. While concern exists about the possibility of deodorants and antiperspirants increasing a woman's risk of developing breast cancer, study findings are inconclusive. The concern is that parabans, which mimic estrogens, may increase a woman's breast cancer risk. A study of breast cancer biopsies was conducted in 2004 and found measurable quantities of 6 different parabans widely used in cosmetics and deodorants. While this may suggest a correlation between cosmetic and deodorant parabans and breast cancer, it cannot be definitively proven the parabans discovered came from deodorants. The National Cancer Institute states that there is no definitive link between using deodorants and developing breast cancer, though one study shows women who began shaving their underarms and applying deodorant before the age of 16 developed breast cancer earlier in life than women who began these hygiene practices after the age of 16. The only problem conclusively linked to aluminum salts is contact dermatitis, or irritation/inflammation of the skin, in some people. Deodorant is dangerous to your clothes. How many white shirts have you lost to smelly, permanent underarm stains? When aluminum compounds in antiperspirant deodorants combine with sweat they tend to sink into nearby fabric. These stains are difficult to remove, (ironically) set in place by most stain removers, and usually smelly. For more information on this process, check the Discovery Health page. Additionally, many deodorants have petrochemical ingredients that like to melt into clothing. In summary, while the evidence does not conclusively link deodorant use to neurological disorders or breast cancer, studies also cannot disprove any potential link. But we all know deodorants can stain our clothing! Make sure to choose unrefined cocoa butter, not the lotion-like stuff you find at the drug store. 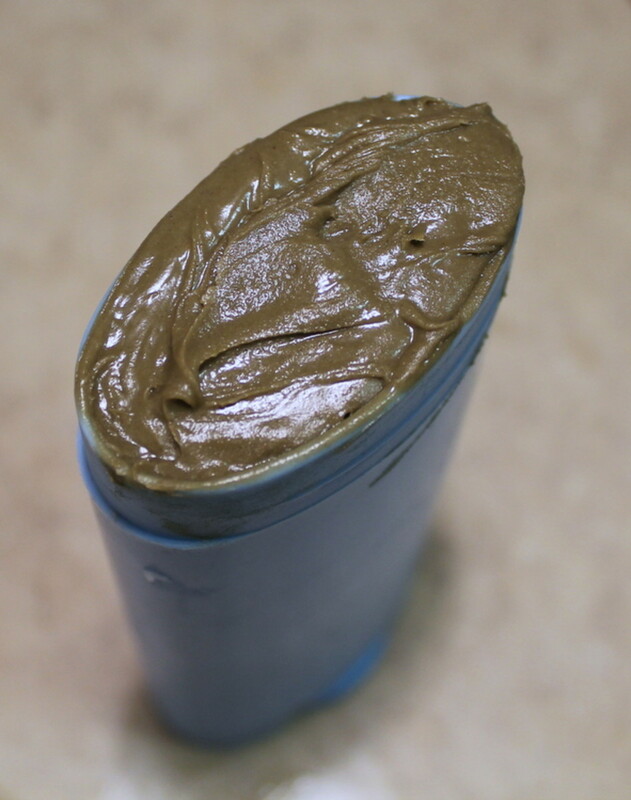 Unrefined cocoa butter is solid at room temperature and smells like chocolate instead of sun tan oil. 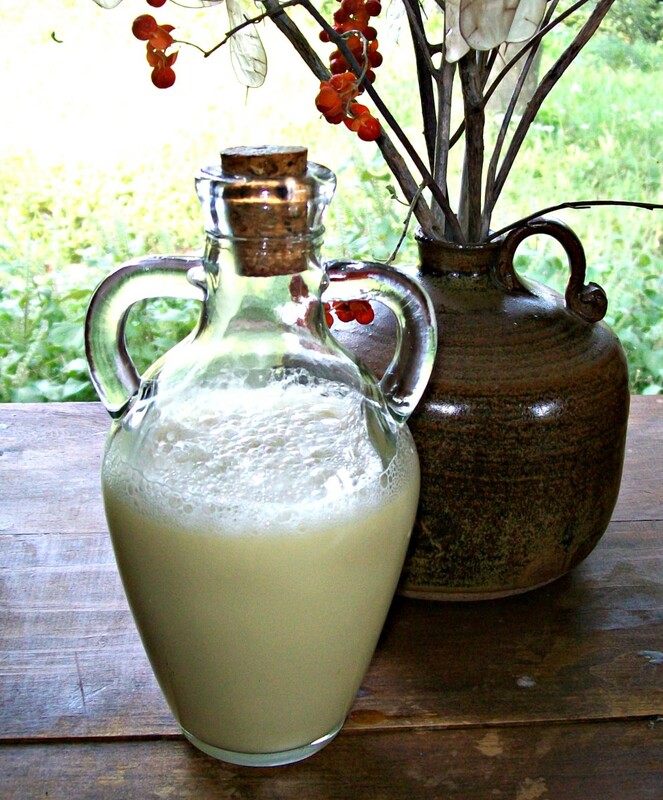 There are many homemade deodorant recipes, but I believe this is the best recipe. 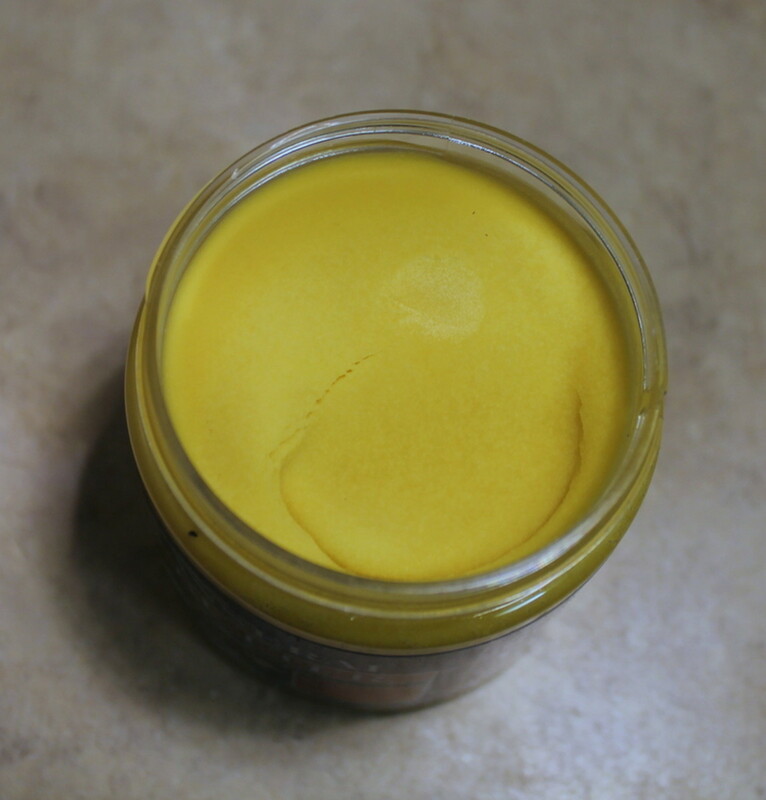 It is effective, easy to make, unlikely to cause skin irritation, and goes on just like a commercial deodorant. A container, such as an empty commercial deodorant dial-up container. You may want to have a second container on hand, just in case you fill your first one. Many homemade deodorant recipes call for baking soda. Baking soda can easily irritate sensitive skin, so (as a person with very sensitive skin) I do not recommend using it. Baking soda and arrowroot are used in homemade deodorants to absorb moisture and to act as a binding agent. 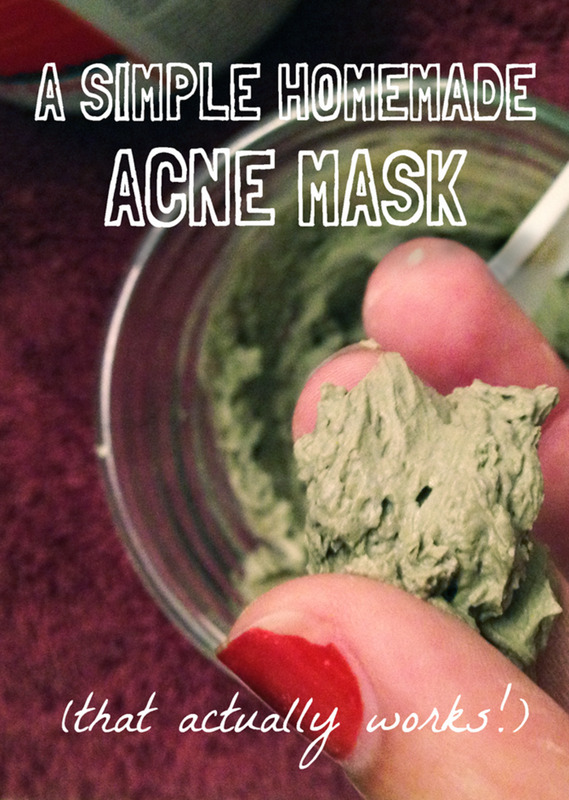 This recipe uses clay, instead, because is less likely to cause irritation. You can use either bentonite or kaolin clay. Bentonite turns green, which is why my deodorant has a greenish color. If you prefer a more refined look, choose kaolin, which is white. 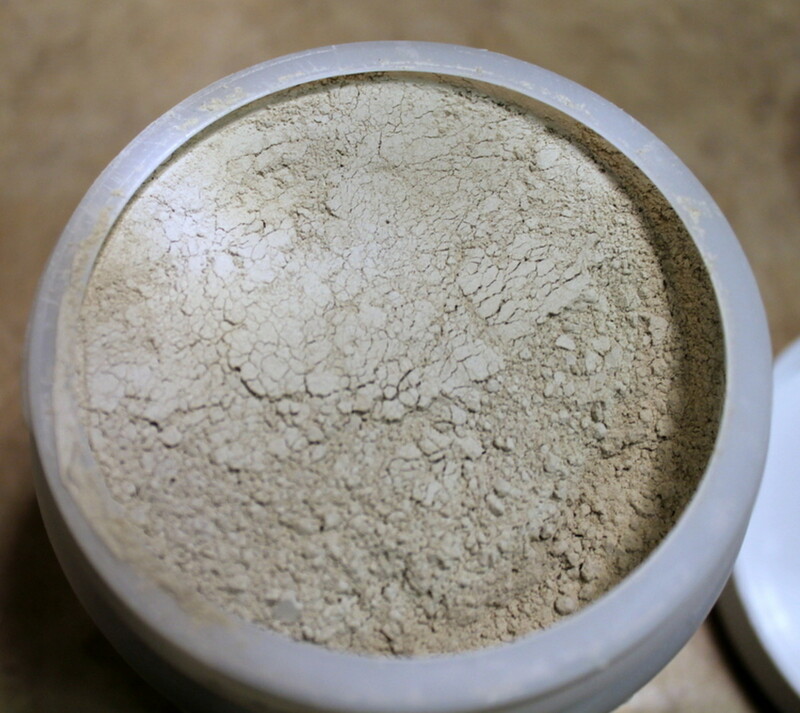 I like bentonite because it is easy to turn into a fantastic facial mask. Deodorant recipes also frequently call for coconut oil. Coconut oil contains natural antibiotics, so it helps fight odors. However, it can also create oil stains on clothing. Olive oil is another common homemade deodorant ingredient, but, once again, it can create oil stains. These oil ingredients also make most homemade deodorants more like a thick cream than a solid, unless refrigerated. Because it uses mostly solid-state ingredients, this deodorant recipe solidifies into something that can be applied just like commercial deodorant. I just don't enjoy scooping deodorant out of a jar with my fingers or putting something ice cold on my underarms! While you can add your favorite essential oils for their scents. do not leave out the tea tree oil. Tea tree oil is naturally anti-bacterial and a major reason this deodorant recipe works! 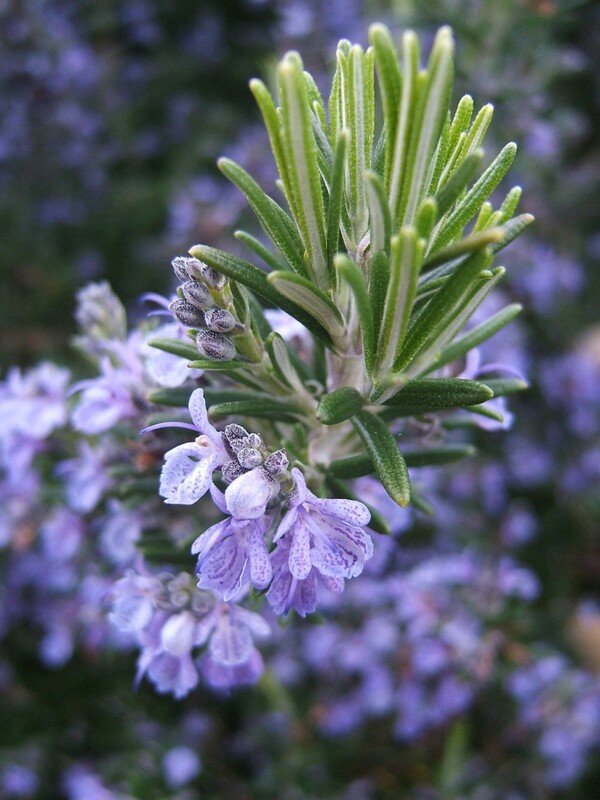 Essential oils are the extracts of so-called volatile oils from plants. Herbs and other plants are soaked in a carrier oil, usually something with very little scent of its own, for a long time in order to extract the 'essence' of the plant. You can think of essential oils as the 'vanilla extract' of the scent world. You can use either clay in this recipe. Bentonite is usually easier to find but, depending on how much you use and what fabrics you wear, could stain the underarm area of your shirt. I haven't had this problem, but others have reported it. Kaolin is while clay, making it a better choice if you wear lots of light colored fabrics. To see the instructions step-by-step in photos, please scroll down a little. Assemble your ingredients and two cooking pots, or a cooking pot and a heat-resistant bowl. Choose one large pot and one smaller pot or bowl. The smaller container should be able to fit comfortably inside the larger pot. Choose a smaller pot that you do not mind filling with wax. You can usually get wax out of a container, but there is always the possibility you could ruin it. Test fit the containers. If the smaller container sits flat on the larger container's bottom, use a metal cookie cutter or jar ring to elevate the smaller container. 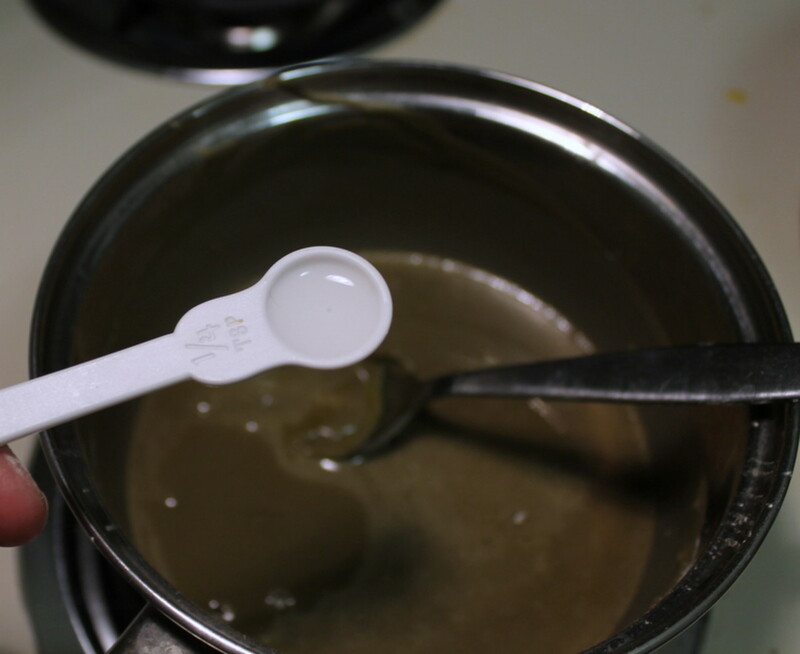 Use your pots to create a double boiler. You should never heat wax directly on your stove. It can reach dangerous temperatures and spontaneously combust when it reaches its flash point! 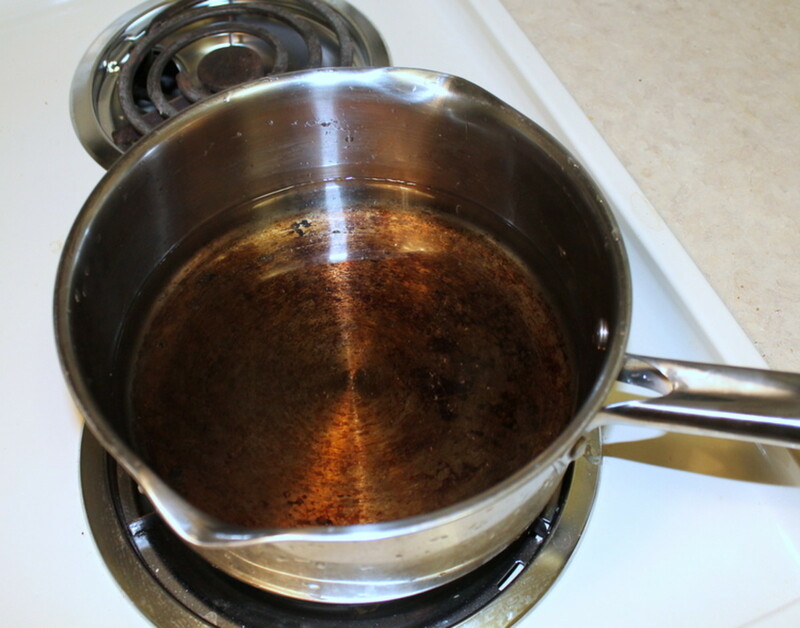 Place an inch or two of water in your larger pot and place it on high heat until it boils lightly. You do not need a full rolling boil - a gentle boil will work just as well. 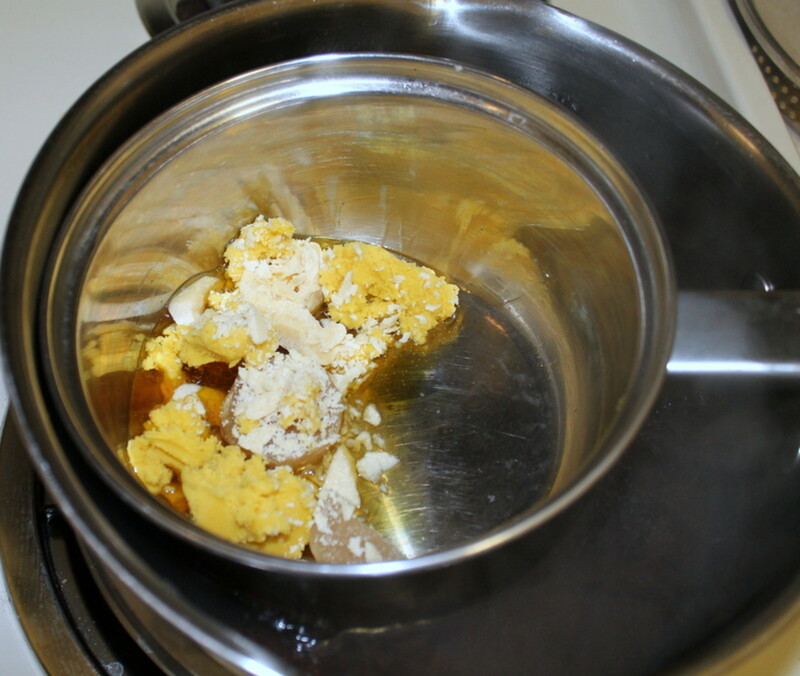 Meanwhile, combine the beeswax, shea butter, and cocoa butter in the smaller pan. 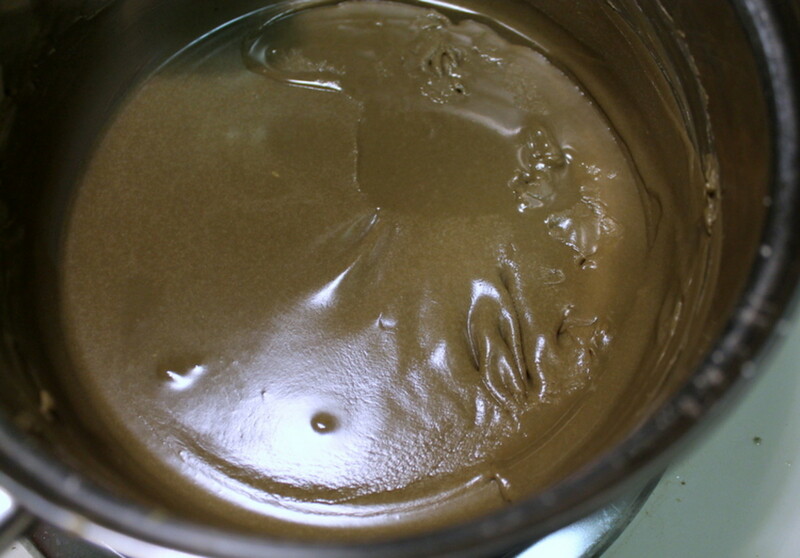 Unrefined cocoa butter is fairly solid at room temperature, so you will either need to scoop it out forcefully (like I did) or warm it slightly in hot water or the microwave. After the water is boiling, set the smaller pot/bowl in the boiling water, on top of the cookie cutter/jar ring, if necessary. Wait for the ingredients to melt. It should only take a couple of minutes. 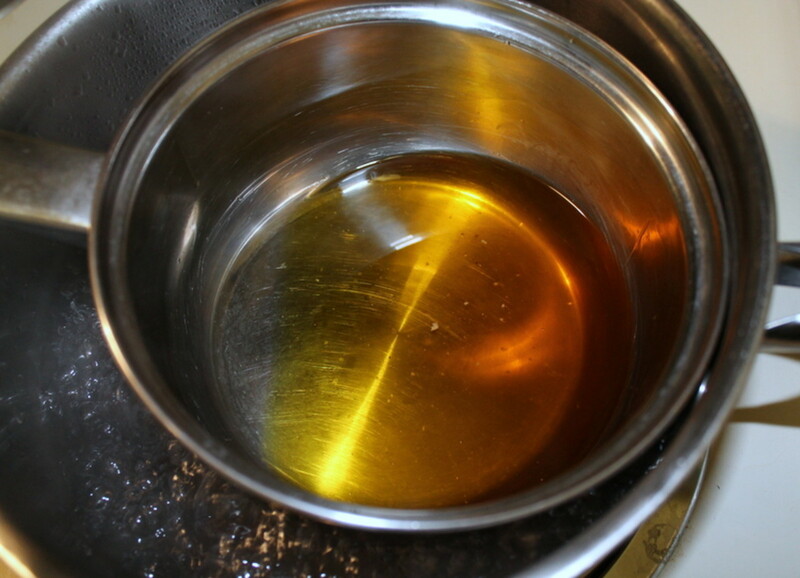 Remove the melted wax and butter from the water bath but leave the water boiling. 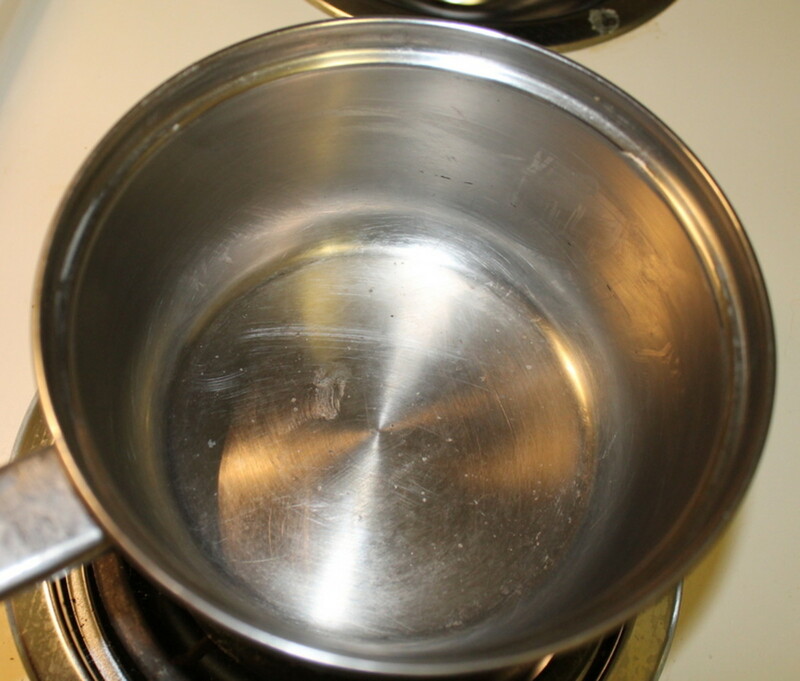 Cover the pot with a lid to prevent excess evaporation before you need the water again to clean your smaller container. 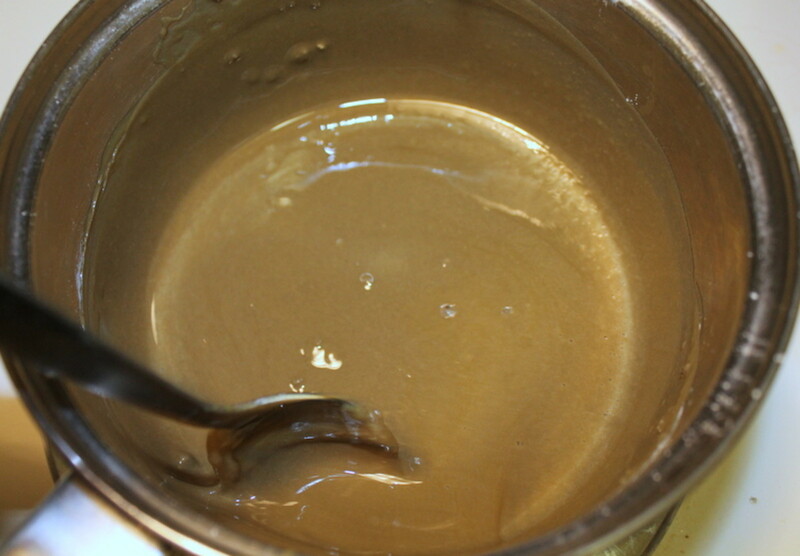 Stir the clay and tea tree oil into the melted mixture. I use almost 4 tablespoons of wax because I live in a hot climate and wanted to make sure the deodorant does not melt too quickly. If you live somewhere cooler, use 2-3 tablespoons of clay. Add extra essential oils, if you want to, at this time. Continue stirring as the mixture cools. When it seems cool enough to not melt the container, but is still pliable, pour or spoon the deodorant into your container. 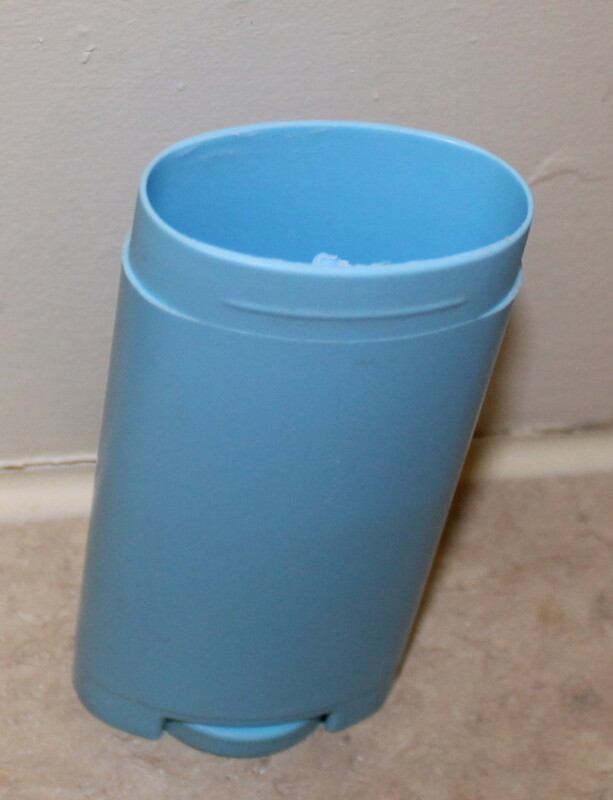 I use an empty commercial deodorant tube. Make sure to dial it down all the way so you can fill the whole container! Tap the container against your counter or table to make the deodorant settle and eliminate air pockets. Add more deodorant, if necessary, and repeat the process. Once your container is full, wipe up any messes and level the deodorant's surface. Fill any additional containers you want to use. After filling your container(s), scrape any extra deodorant mixture out of the pot and throw it away. Wipe the pot with paper towels. 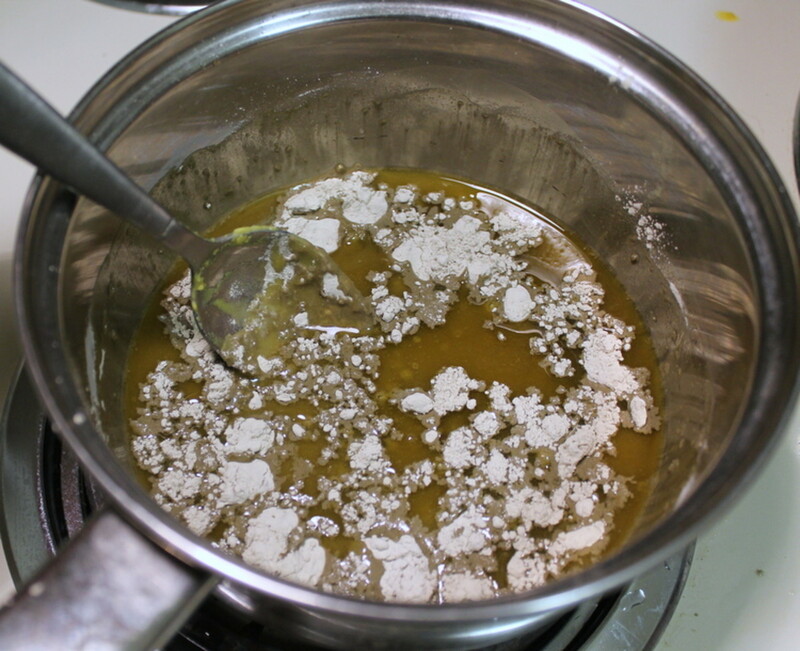 Then, place it back in the boiling water to re-melt any remaining mixture. Once it has melted, carefully wipe or pour it out. This should remove most of the mixture from your container. A scrub with soap and hot water, or a run through the dishwasher, should return this pot to usable status. Allow the deodorant to cool overnight before using. You don't want to burn your sensitive underarm skin! Have you tried an all-natural deodorant before? Yes, a commercially-available one and I didn't like it. Yes, I use commercial or homemade natural deodorant all the time. No, and I'm not going to start now. If you don't take a shower before applying this deodorant and then put on a smelly shirt, you will come to the conclusion that this recipe doesn't work because you will smell funny. Underarm smells are not actually caused by sweat. Sweat, itself, doesn't stink. Instead, bacteria that lives on your skin, and loves the fairly airless underarm environment, causes funky odors. When your armpits get warm and sweaty, this bacteria multiplies, which multiplies smells, too. Make sure to bathe before testing this homemade deodorant to ensure you kill off as much lingering bacteria as possible. You can even wipe your underarms down with rubbing alcohol to ensure you both kill bacteria and remove lingering traces of any commercial deodorant. Then, choose a shirt that doesn't have stinky, baked-in deodorant stains. I understand if you're incredulous about this recipe - it sounds too good to be true! I work outside in the South, so if it works for me, it should work for just about anyone. If you do try it, please leave a comment to let me know about your experiences! I'd love to hear if you change up the recipe to add new scents and how well it works for you. Hi! Thanks for this recipe. I just made it but found it really sticky on my skin. Do you have any suggestions for recipe alternations? Thanks! What purpose does the shea butter serve as opposed to using just cocoa butter? I made this and it works well but I'm finding it's too hard to scoop up. I didn't have deodorant containers so I used a jar but I'm really struggling getting it out to use. 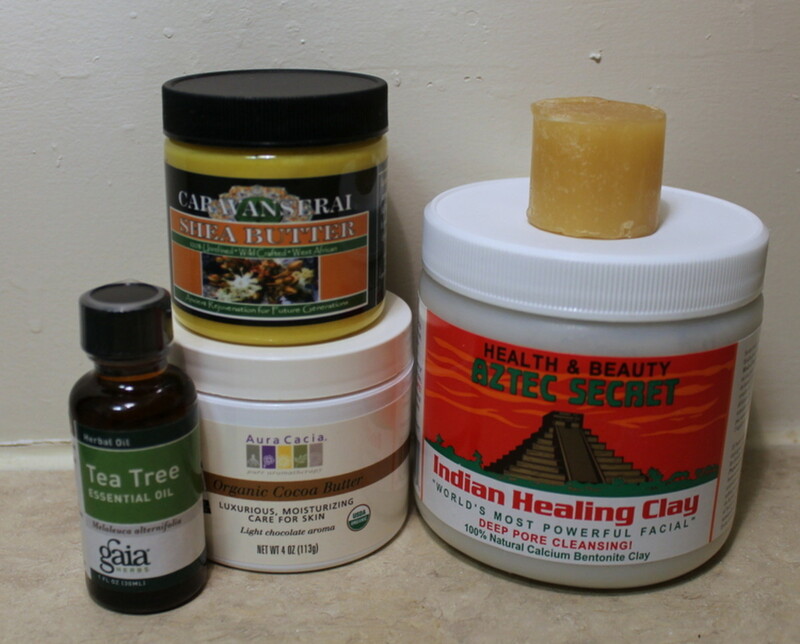 I have Moroccan clay and liquid Bentonite clay (from Whole Foods. Didn't know it came in liquid. Can I use either of those for the clay? If you're house is like 90 degrees, not as solid. If it's a normal temperature, fairly solid. It's usually ever so slightly harder than most commercial deodorants. How solid is this once it's made? I don't add baking soda to mine, but I know it's popular. I do think kaolin would be a good sub-in, though, if you have that at home! 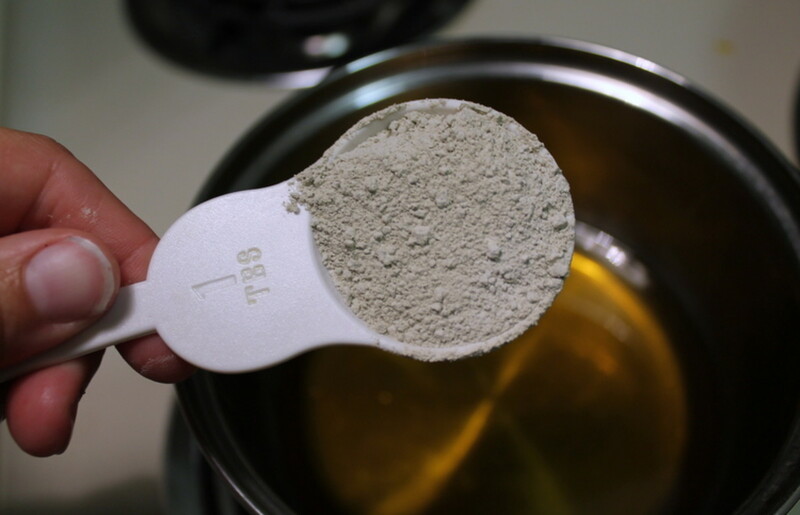 Homemade Bentonite Clay and Baking Soda Deodorant. A general rule for making topical personal hygiene products is to only use on your recipe sounds lovely, and I happen to have all of the items in my pantry. Sorry - cut down on the wax, not the clay, if it's cooler! I have just tried homemade deo's but the recipe I used had baking soda in it. My underarms looked like brown leather like spots and started burning after 3days. However, I loved that I didn't smell at all! I'm excited to try your recipe but I'd rather use coconut oil instead of cocoa oil. In any case in your recipe you say that you use 4 tbsp of wax and if in a cooler climate 2-3tbsp of clay? I'm confused on the amounts. 4tbsp of clay or of the beeswax? If you could clarify I would greatly appreciate your time. Thanks. I can't wait to try this!!!! Hm. That's an interesting idea! I bet it would work well in facial masks. Thanks for stopping by and sharing! I just read on another recipe the idea of using probiotics (like opened capsules) in your deodorant to fight bacteria. I'll be using this recipe, but adding that to! I also heard at a medical lecture using that same technique in a facial mask for acne! I hope you enjoy it and thanks for stoping in! Great hub, surely going with natural deodrant is essential and will be good for your skin, i haven't tried this one but surely will. voted up!! Oh, no! You shouldn't have that problem if you use kaolin - it is a white clay instead of a green clay. It's strange that it stained your skin, too. I haven't heard of that happening before! My mom uses this every day and she hasn't mentioned it, and I use it, too, and haven't noticed that. I'm sorry you had this experience! I tried this and it looked just like the picture at the very top, a brown mixture. I tried it and it was fine...until I took off my shirt at the end of the day and saw that my armpits were stained a very obvious brown (needless to say I was mortified that I was walking around like that all day). So I tried to see if it was similar to the results of my beeswax deodorant (which washes out), but it is still present in the armpits of that shirt after at LEAST 10 washes (I've been wearing it as a pajama shirt since the incident so that I'm not washing a clean shirt and wasting water). 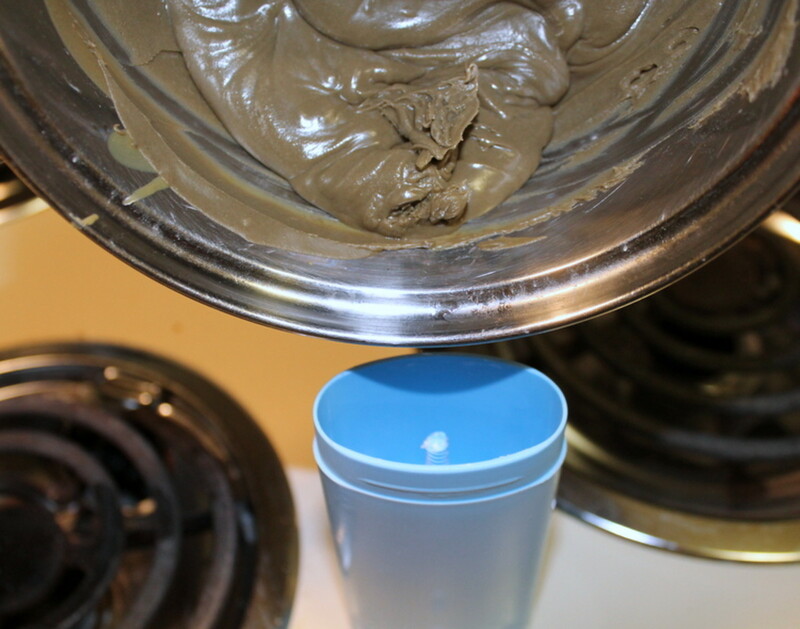 No more bentonite clay for me in my deodorant recipe trials. Oh and fyi for other readers, my beeswax issue was because I put on too much and the wax basically melted into my shirt, temporarily staining it (I also think that a little bit of beeswax in the initial recipe goes a loooong way). Pretty much! It's the way I've always been and I am loving this current DIY trend because before it I was just that weird girl who made everything. Now it's almost cool or something! It seems as though you can handmake everything these days. Such an interesting idea. 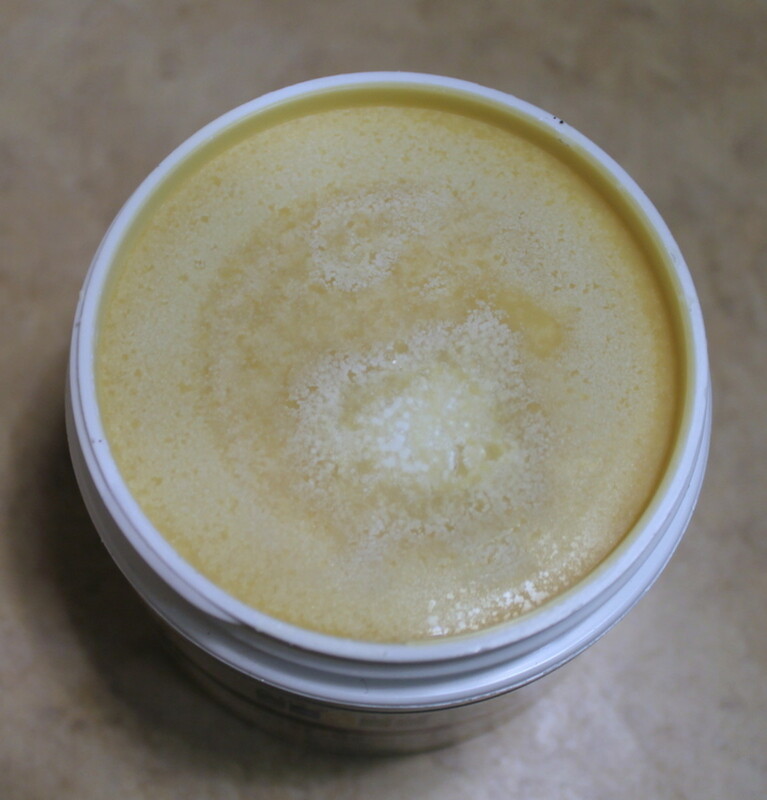 I created this version of the recipe during warm weather and would recommend scaling it back for cold weather by removing some of the beeswax. I would give it a try, as is, because I know how this behaved in the hot weather. I hope it works for you and you enjoy it! I made some for my mom's birthday and she's still using it months later because she loves it. I am planning to give this recipe a try but if I use more beeswax to make it more solid, since I too live in a hot area, should I use less shea butter? And if I keep the same amount of shea and still add more wax should I add more clay? Thank you for the recipe by the way :), I have tried so many recipes and purchased so many natural deos but they either work but give me a rash or don't work at all. Hopefully this one will work out! Not like St Pat'a green, but there can be a slight color, depending on how thickly you apply it. Greens neutralize reds, so if you get red bumps from shaving (I do!) they basically cancel out. For no risk of green, but white kaolin, instead. There wasn't kaolin locally but there was bentonite, which is why I used it. I haven't had any problems, but if you're worried about wearing it with white clothes you could get white kaolin, instead. Does the bentonite clay leave stains on your clothing? I made some for my mom's birthday and she loves it. If you give it a try, I hope you do, too! Thanks for the vote and share. During my practical sessions in D. Pharm I have tried making many products. But I haven't ever tried deodorant . I'm glad you're experiencing success with your current deodorant trials and hope you like the addition of clay! It really helps it hold together better. I made deodorant a couple of weeks ago and it works great. Now I'm looking to kick it up a notch and add Kaolin Clay. Had to look quite a while to find one. Glad you are here and sharing your recipe. Thanks. Good for you! Research shows a connection between keeping household cleaners in the home and problems like asthma. They really can do damage to you and your family! Good luck with the next phase of your project. Making homemade lotions and personal care products is on my to do list. I started making my own cleaners and eliminating those chemicals from my home so I am ready to eliminate all the chemicals that are in lotions, make-up, and skin products. I look forward to trying this out! Interesting, I hadn't heard that one! I'd heard that alcohol in a spritz bottle works well, too. Unfortunately, I work outside in typically hot, humid conditions and I'm afraid a liquid might just sweat off too easily for me. I'll have to give it a go during the cooler months, though! Vinegar is a great natural deodorant and it can be used in one of those little spray bottles which can be bought in a pharmacy. You might spell like french fries until it dries, but once it does, it's much more effective than commercial products! Cool! Thank you, Farmer Rachel! There are so many unpronounceable ingredients in there, who knows which one it is. Thanks for stopping by! Hey - how did I miss this Hub? I have really sensitive skin, too. In fact, I can't even use regular antiperspirant deodorant because I'm allergic to the aluminum ingredient, whether it's tetrachlorohydrex or pentachlorohydex, or tri-, or whatever! I make my own soap for my sensitive skin, guess it's time to try making deodorant, too :) I'm bookmarking and pinning this one for future reference! You're right - it is a huge lymph node center! People always seem to forget about the lymphatic system. Hahahaha. You're right - the green clay doesn't look that beautiful. If you try it, I hope you like it! I never use regular deodorant, not since I found out how harmful aluminum is - why on earth would we want to put such a dangerous substance near a bundle of lymph glands anyway? This looks great. Well, it doesn't actually look great but you know what I mean. Going to pin for future reference. 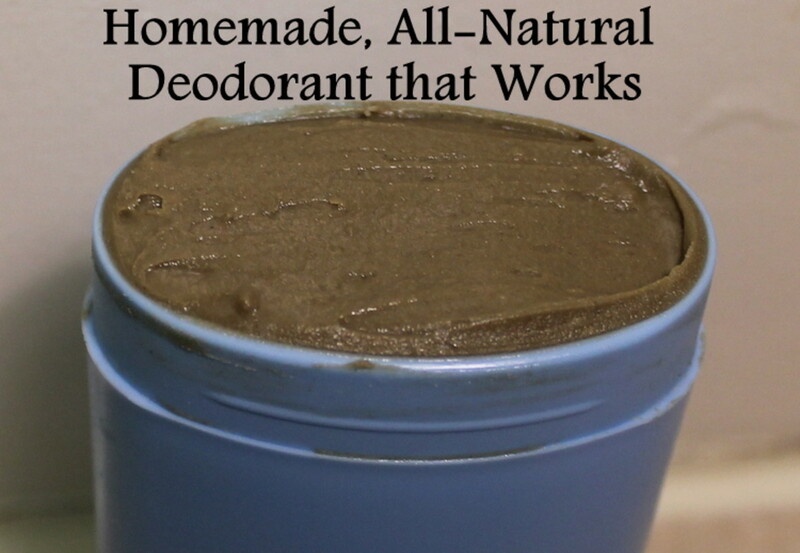 I knew I couldn't be the only crazy person in the world who made my own deodorant! I'm still loving it and have given samples out to incredulous family members. Thanks for stopping by! I've been recruiting family members to try this. So far the response has been surprised and positive. I think they didn't really believe it would work! This is a great idea, Natasha. 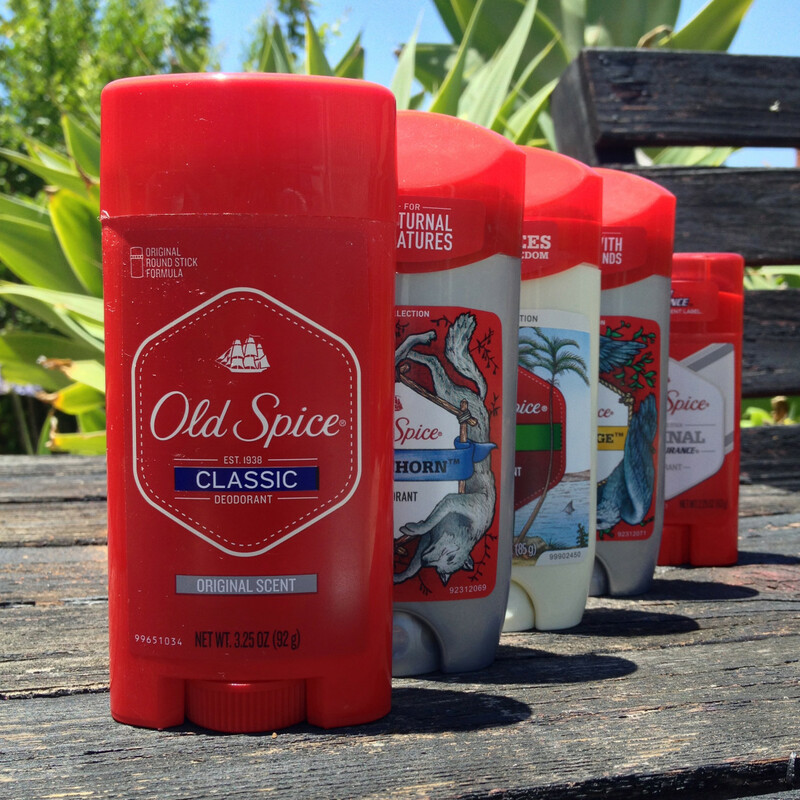 Commercial deodorants have toxins that harm our bodies and over time they tend to not help in preventing body odor. 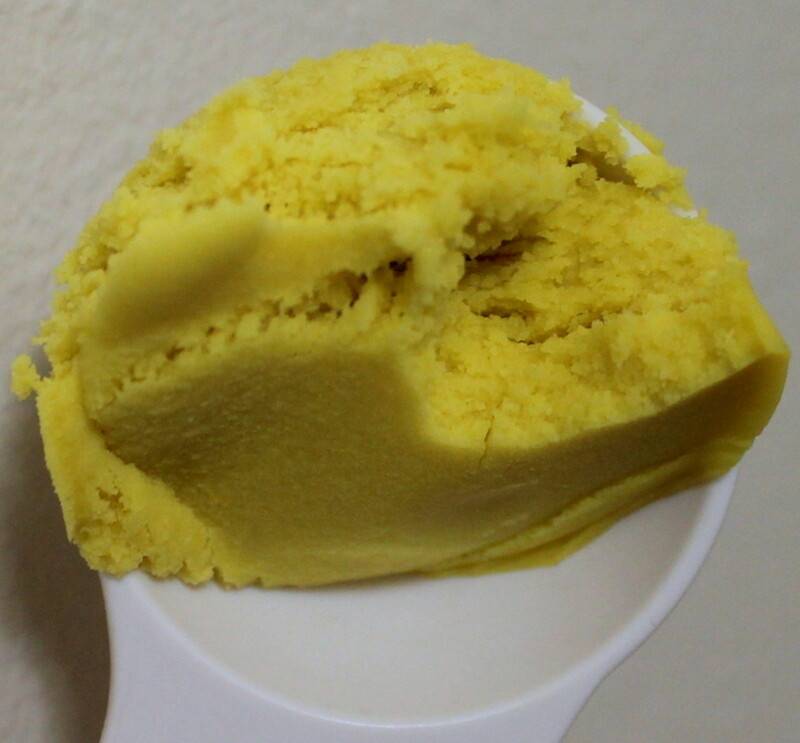 I have a natural product that I use right now, but your home-made suggestion is even better. Voted up. Honestly, I'm not really sure what made me decide to try! But I'm glad I did. Thanks for voting and sharing. I confess, the thought to make my own deodorant has never crossed my little warped mind. Great information, Natashalh! Voted up and shared. Great idea. Reminds me of my one chemistry professor; he made his own soap, toothpastes, shampoos, and deodorant. Excellent! I hope you have the chance to try it and enjoy! Very interesting ^_^ I like the moisturizing ingredients... and tea tree smells good to me... might have to give it a go. I love making things for myself, but I only started to one recnetly. I have been making my own laundry soap for years, though! Thanks for stopping by. Well, this is a new one on me - homemade deodorant. Sounds interesting, though, and worth trying. Well, this is very moisturizing, so it should be great for you! Thanks for stopping by.